A couple months ago I bought The Wet Brush and was hooked. I would venture to say that it is the best hair care purchase I have made all year and my new favorite brush. I have thick hair that dries curly on its own and gets tangled easily and I can run The Wet Brush through it and it doesn’t even pull my hair. It’s honestly like the magic detangling brush and of course comes in so many cute colors. I have to confess, I even bought smaller one for my dog and I’m pretty sure it’s her favorite brush as well. Great post! I have been wanting to try the Wet Brush for awhile now...looks like I'll have to go get one! The Wet Brush is amazing! You will love it! 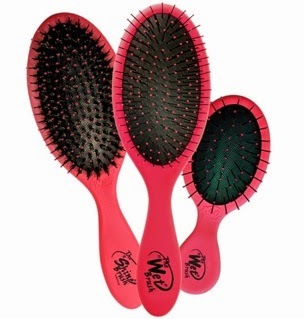 I have never tried the wet brush, but I do have a tangle teaser and love it! Makes unraveling my tangles a piece of cake. I have heard of a tangle teaser before, I will have to look into it! I just got one of these a few months ago too! I love it. My hair gets tangly all the time, and this brush works like a charm. It really does, it's like magic! I've heard a lot of good things about these brushes but I have yet to try one. I need to order one soon! You would love it! I think they sale them at target as well! Sounds awesome, my hair can get super tangled after a long day so I will have to check this out. This brush i perfect for hair that tangles easily! I got one a few months back and there is absolutely no looking back! 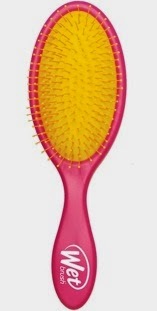 It detangles my curly hair perfectly, love this brush! I actually didn't even know they made a pink one till I saw it on the internet! I actually just have a blue one, a silver one, and a purple one, and my dog has the little pink one. I have been wanting to try one of these for months now. My hair is falling out a lot because I had a baby 4 months ago, and I think this would be nice and gentle! The Wet Brush is get, it doesn't pull my hair or anything! The Wet Brush is just amazing, I love it! My hair stylist loves it too, when she uses it on my hair she can get my hair brushed out in ten minutes compared to forty minutes when using any other brush! My hair stylist is the one who introduced me to the wet brush! I love it! this is my favorite brush of all time! i never realized how bad my tangles were until i tried it! It is my favorite as well!